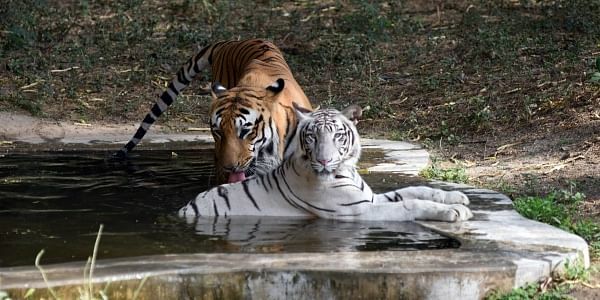 White tigress Nirbhaya and Royal Bengal tiger Karan have been moved into the same enclosure by alert zoo officials, who claim they have noticed a certain chemistry building up. NEW DELHI: Call it a mix-and-mate proposal, the first in Delhi Zoo in the last 27 years. White tigress Nirbhaya and Royal Bengal tiger Karan have been moved into the same enclosure—No. 10—by alert zoo officials, who claim they have noticed a certain “chemistry” building up between them over the last several months. The obvious purpose is to get the big cats to make cubs, May-June being the prime mating season for tigers. The last time such a thing was done was in 1991, when Sundar—a yellow tiger—and Shanti—a white tigress—were moved in together. That union had produced twin cubs: Swaraj, who was white, and Aman, who was yellow. This time round, all eyes are on Nirbhaya, born in Delhi Zoo in 2015, and Karan, born in Mysore Zoo in 2013 and brought to Delhi a year later. For both, this will be the first mating experience, zoo officials said. “In the two days that they have been in the same enclosure, they have mated 15 times. So, our move has been successful. We are keeping strict vigil as much attention and care are required. The male and the female are responding positively, as we had expected,” Renu Singh, director of Delhi Zoo, said. “We decided to go in for mixed pairing when we noticed the attraction between them. In a way, their attraction emboldened us. This will help us mix the bloodline among tigers, and if successful, empower us to undertake more such experiments,” Singh added. Although it hasn’t been confirmed whether Nirbhaya is with cub, excited zoo officials are looking at a September delivery. A tigress pregnancy lasts around three and a half months and the cub weighs about 1kg at birth. Nirbhaya is the offspring of the white male tiger Vijay, who mauled a man in his enclosure a few years ago, and Kalpana. Both are in good health in Delhi Zoo. Karan is the offspring of Brahma and Manya, who are in Mysore Zoo.